Can anybody help me troubleshoot this problem I had today? No, it's a genuine. Bought it like 12 years ago. I'm going to try to see if they honor the "lifetime warranty". 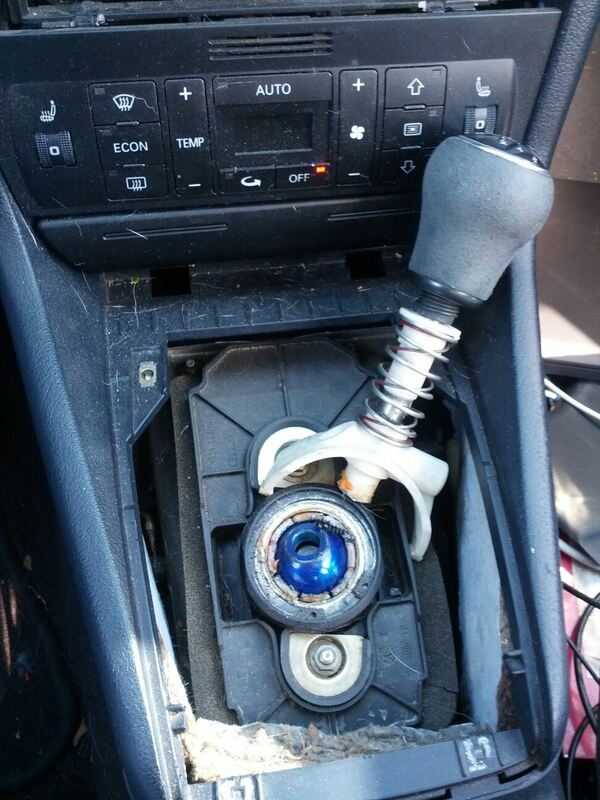 I will probably end up machining my own as it doesn't look like there are any other shifters out there worth a damn. I think the issue may be the nut between the steering wheel and the shifter. ^^^ Do you have an AFR gauge in that car? I have the issue that the car goes full rich when I do a 2-3 and 3-4 shift with NLS... and only recovers if you let off and get back on the gas. I've been testing out the AL and NLS code on a friends car and I have a quick question. Not sure if it has been mentioned on here before or not but if the NLS is used, it will work fine 1st to 2nd and 2nd to 3rd but when the clutch is reengaged in the 3rd gear the car is in some sort of limp mode and builds much less boost then it should be (would be without using the NLS function). Has anyone else seen this? Any particular things that I should be looking at to correct this? Yes, in the drag run video with my girl friend in the car that I have posted that is exactly what happened. I have it in logs too. It only does it if you do a full out run, ie every gear or als then nls back to back. I tend to skip gears now for best results as I haven't had time to investigate. It massively regards timing and dumps fuel. I am having the same issue also. when I use nls from 2nd-3rd I can hear the engine pinging durring NLS and then my boost stays at 10psi and will not go over that until I let off or shift into 4th normaly. I dont have a AFR gauge so im not sure what my fuel is doing but if I had to guess some sort of failsafe is activating causing the boost cut. car wouldn't start this morning! No communication from the ECU either, had to put my spare ECU in. I used WinOLS to patch the code in so checksum should be ok. Dnly started once last night when testing - should know better than that! Found my problem - it was just a bad checksum, WinOLS found it straight away, think I know why it wasn't picked up the first time. EGT's - for launch they at least they are not high, under 500C. This is essentially a spark cut rev limiter that you will not be on for a long period of time, no different to how lots of turbo cars run. Retarded timing and jacked throttle on overrun is different. Car wouldn't start. I cleared DTCs (misfire) and the car fired right up. I'm assuming that isn't a checksum problem? although it could be misfire diagnosis DTC from doing too much AL on a motor that isn't at 80C yet... a ton of unburnt (and non-vaporized) fuel everywhere, I assume. I had to have my misfire counter disabled in order to run this. You can still log the channels and watch the counters increment with it disabled, however it is done by Eurodyne. they just reset fast before an overflow, which triggers the retard I am guessing. A temp misfire disable would be slick. Just re-enable it when you need to log misfires for any reason and turn the functionality off. In any case, i have a request for setzi (or anybody else..) is there a way to disable this if engine temp is below 80C? And a way to disable misfire detection while AL/NLS is active? We need to disable knock detection when the ignition cut kicks in. That's what I ended up buying in the essence of time. We'll see how it holds up. I've missed third a few times with it, whereas the last shifter didn't like second. I just need some practice I think. As far as the ALNLS, I really haven't had any issues with knock control. What are you guys running settings wise? I've got at least 5,000 miles and 100 or so launches without any issues you are describing. The only thing I've changed is the ignition cut duration to 1500ms. I also have my EGT's disabled. what was the difference when you setted ignition cut duration to 1500? Shift effort was reduced even more. One more thing i noticed; changing FTOMN seems to affect the *soft* rev limiter behavior.